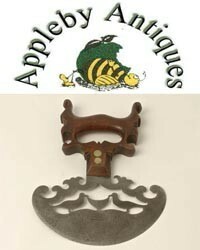 We started in the antique business in 1983. At first we were were regulars on the fair circuit and for over 20 years we have had various outlets on the Portobello Road. We now trade from Atlam at 111 Portobello Road. The shop is open Monday to Friday 10am till 4pm and Saturday 7am till 5pm. During that 35 years our business has evolved considerably as tastes and styles change. We started out dealing in kitchenalia and early English pottery but now our stock is quite different. Being keen cooks we still love kitchenalia, but much of our stock can still be used. One of our major lines is Antique copper kitchenware which we re-tin and turn out ready for use. Not all antique copper is good enough to make usable again so we travel thousands of miles to source copper that is both good quality and in good enough condition to re-instate to its’ former glory. Our clientele includes professional chefs, keen amateur cooks, food historians, stately homes and the entertainment industry. We have always specialised in antique moulds, ceramic, pewter and copper, and love the history of moulded food. If you are looking for copper purely for decorative purposes we also supply this and you don’t need to pay the premium for the usable pieces. We have always worked with the customers on our extensive database. If there is something within our field that you are looking for, just email us and we will contact you, and try to work with you as well. An enquiry does not put you under any obligation. We also carry a range of quality, 19th century, French crystal glass, again more for use than for collectors. We have a passion for antiques that have lived and can live again. APPLEBY ANTIQUES to provide own terms and conditions. Consumer Contracts Regulations apply.